Figure (a) Comparison between conventional acoustofluidic device operation and portable operation. The portable control platform can be used with either a traditional benchtop microscope or a portable microscope based on a cell phone camera. Not to scale. (b) Photo of the cell phone, modified speaker and acoustofluidic device. Signal measured from the speaker (c) before and (d) after passing through the RLC filter circuit to increase the voltage. Here we report on the effort to provide an easy-to-use and portable system for controlling sharp-edge-based acoustofluidic devices. With the use of a cell phone and a modified Bluetooth® speaker, on-demand and hands-free pumping and mixing are achieved. 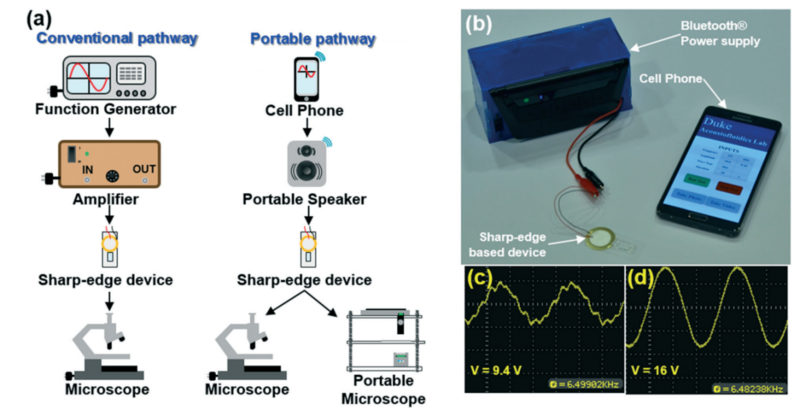 Additionally, a novel design for a sharp-edge-based acoustofluidic device is proposed that combines both pumping and mixing functions into a single device, thus removing the need for external equipment typically needed to accomplish these two tasks. These applications serve to demonstrate the potential function that acoustofluidic devices can provide in point-of-care platforms.